Learn how to safely and responsibly recreate with your dog. We will explore the basics through excerpts from "Best Hikes With Dogs Western Washington", by Dan A. Nelson. There’s nothing like sharing the great outdoors with your best friend. However, it’s important to keep trail etiquette and safety in mind when you explore with a dog in tow. Below are excerpts from the Mountaineers Books title Best Hikes with Dogs: Western Washington by Dan A. Nelson. Learn what to do (and not to do!) when you and Fido hit the trail. In an effort to keep our wilderness areas wild and our trails safe and well maintained, the land managers – especially the National Parks Service and U.S. Forest Service – have implemented a sometimes complex set of rules and regulations governing the use of public lands. The rules throughout Washington vary wildly through different forests and regions of the state. 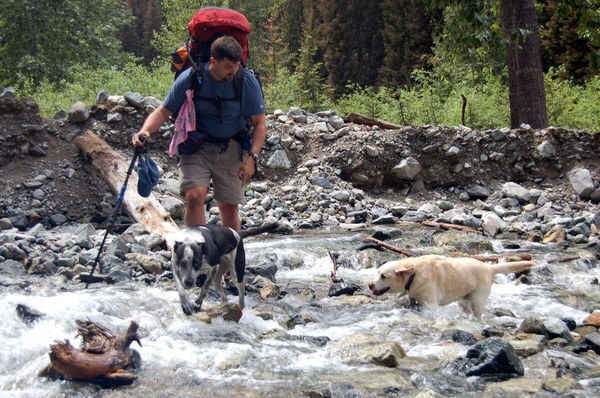 The first hard-and-fast rule is that dogs are not permitted on any trails in Mount Rainier and Olympic national parks, and they are allowed only on the Pacific Crest Trail in the North Cascades National Park. In general, dogs are allowed on trails open to horses and many trails open only to hikers, with a few notable exceptions. Dogs are outright banned on the trails in and around the Enchantment Lakes basin. The dog ban stems from the fact that the basin is extremely fragile, and even human access there is severely restricted and regulated. Further, on many heavily used trails accessed off Interstate 90, leashes are required. No special permits are needed for dog hikers. All trail users, however, are required to purchase a Region 6 Forest Pass from the U.S. Forest Service to use any trailhead within the USFS Region 6 Forests – that is, all national forests in Washington and Oregon. The passes sell for $5 per day or $30 for an annual pass. Editor's Note: You can purchase your Region 6 Forest Pass (AKA a Northwest Forest Pass) here or at our Seattle Program Center. With ever-growing populations of people and dogs on the Earth, we each must work harder to ensure that we leave our pristine wild lands as undisturbed as possible. That means following the tenets of Leave No Trace camping and hiking, and you must apply those tenets to your dog as well. As the name implies, the goals of Leave No Trace hiking are simply to eliminate as many signs of human (and canine) passage in wild country as possible. As a national nonprofit organization, Leave No Trace works to educate hikers, backpackers, horse packers, mountain bikers – and all other outdoor recreationists – about leave No Trace practices and works to minimize the impacts of humans and their animals on wild lands. Editor's Note: Watch our Low-Impact Recreation Skills videos for more information. As a hiker, you are responsible for your own actions. As a dog owner, you have an added responsibility: your dog’s actions. When you encounter other trial users, whether hikers, climbers, trail runners, bicyclists, or horse riders, the only hard-and-fast rule is to observe common sense and simple courtesy. It’s hard to overstate just how vital these two things – common sense and courtesy – are to maintaining an enjoyable, safe, and friendly situation on our trails when different types of trail users meet. Hikers who take their dogs on the trails should have their dog on a leash – or under very strict voice command – at all times. Strict voice command means the dog heels when told, stays at heel, and refrains from barking. When dog owners meet any other trail users, dog and owner must yield the right-of-way, stepping well clear of the trail to allow the other users to pass without worrying about ‘getting sniffed’. When dog meets horse, the dog owner must first yield the trail but also must make sure the dog stays calm, does not bark, and makes no move toward the horse. Horses can be easily spooked by strange dogs, and it is the dog owner’s responsibility to keep his or her animal quiet and under firm control. Move well off the trail (downhill from the trail when possible) and stay off the trail, with your dog held close by your side, until the horses pass well beyond you. Those of us who love to hike with our dogs must be the epitome of respectful, and responsible, trail users. When other hikers encounter dog hikers behaving responsibly, they will come away with a positive impression of dogs. In this way, we also help ourselves by preventing actions that could lead to additional trail closures or restrictions for dog hikers. In short, hikers can usually avoid problems with other trail users by always practicing the Golden Rule of Trail Etiquette: Common sense and courtesy are the order of the day. Obedience training. Before you set foot on a trail, make sure your dog is trained and can be trusted to behave when faced with other hikers, other dogs, wildlife, and an assortment of strange scents and sights in the backcountry. If he can’t behave, don’t take him hiking. Doggy backpack. Let the dog carry her own gear. Dog food and trail treats. You should pack more food than your dog normally consumes because she will be burning more calories than normal, and if you do end up having to spend an extra night out there, you need to keep the pup fed, too. Water and water bowl. Don’t count on there being water along the trail for the dog. Pack enough extra water to meet all your dog’s drinking needs. Leash and collar, or harness. Even if you dog is absolutely trained in voice command and stays at heel without a leash, sometimes leashes are required by law or just by common courtesy, so you should have one handy at all times. Insect repellent. Be aware that some animals, and some people, have strong negative reactions to DEET-based repellents. So, before leaving home, dab a little DEET-based repellent on a patch of your dog’s fur to see your dog’s reaction to it. Look for signs of drowsiness, lethargy, or nausea. Remember to restrict repellent applications to those places the dog can’t lick. ID tags and picture identification. Your dog should always wear ID tags, and I’d heartily recommend microchipping him as well. Dog booties. These help protect the dog’s feet from rough ground or harsh vegetation. They also keep bandages secure if the dog damages its pads. Compact roll of plastic bags and trowel. You’ll need bags to clean up after your dog on popular trails. When conditions warrant, you can use the trowel to take care of your dog’s waste. Before heading out with your pooch, there are a few things you can do to make the trip safer and reduce the chances of having to use your first-aid kit. For starters, get your dog in trail condition. Too often, we tend to think of dogs as some kind of wonder athlete – they are ready to go at a moment’s notice and they can hike all day, every day, without a problem. Sorry, folks, but dogs can be couch potatoes too. They suffer sore muscles, charley horses, sprains, and strains just like we do. To help canines avoid muscle soreness and injury, start them on a conditioning program before you head for the hills. All dogs love morning walks, and hiking dogs (not to mention their hiking owners) will benefit greatly from a long walk in the morning before you head for work and another in the evening when you get home. Editor's Note: Read Canine Field Medicine: First Aid for Your Active Dog by Sid Gustafson for more in-depth information. DAN NELSON AND FRIENDS. PHOTO COURTESY OF MOUNTAINEERS BOOKS. Excerpted and adapted from Best Hikes with Dogs: Western Washington, 2nd Edition by Dan A. Nelson.